It's possible and necessary to use the same inspiration to create different knit outcomes. By using different techniques and yarns you can end up with a completely alternate swatch or ones that can sit together within a range. Over the next few weeks we'll look at different outcomes from the same inspiration. Like this one, which the inspiration of, has been posted before. Croquis' are fun little pattern ideas that textile designers generate before turning them (well, the good ones anyway) into full pattern designs. Textile inspiration can start with anything really. But normally, for me, it begins with either an illustration, croquis (which is a small test pattern) or photo. Illustrations, especially fashion ones give a lot more information than the other options. This can be really helpful in deciding things like fibre, density of the fabric, and even how much detail may or may not be added. Like any form of design outcome (and probably like most things in life?) the more you know, the better off you are. For me, knitting is all about translation. It's about taking inspiration from an image or artwork or texture and recreating it into a textile. Recently, I was digging through some older work and it gave me the idea of Translation Tuesday. A special day to celebrate textile translations. (And perhaps also celebrate words that begin with the letter T.) AND because I'm a terrible blogger and this seemed like a fun way to at least TRY and be a bit consistent with posts. So here we go. 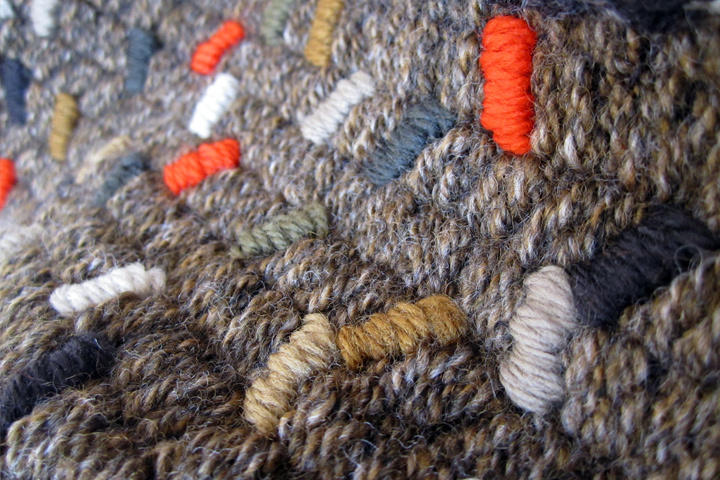 It'll be a mix of old and new work and will showcase the textile inspiration and the knitted outcome. And it'll happen (fingers crossed) every Tuesday! 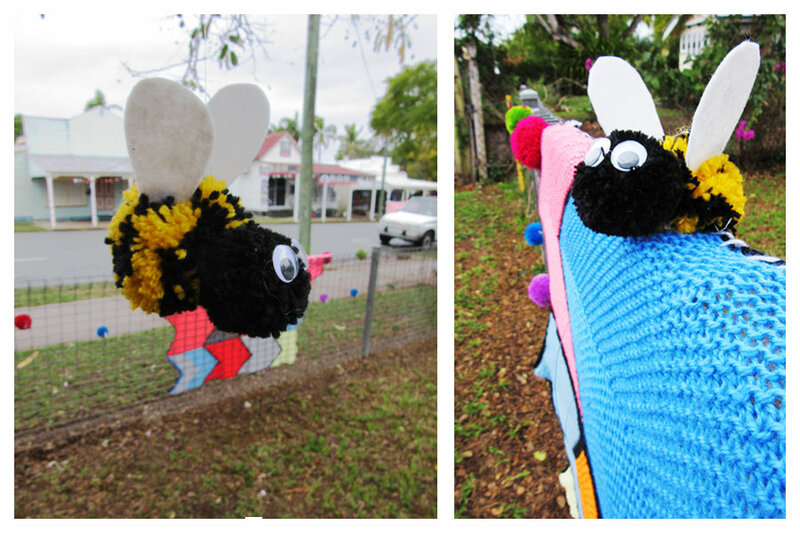 This weekend was my first experience in yarnbombing. I've never been much into it to be honest. Sometimes I just don't 'get' it. Like do tree branches really need extra warmth? But because my small home town was having a big community event, we started to knit. (Me, my mum and my sister.) And knit. And knit. And pom-pom. AND knit and pom-pom. For weeks until it was the night before... and then the rain came. Which was very unfortunate and a bit annoying because we live in 'the sunshine state'. Where there is sunshine approximately 350 days a year. Here's our top tips for first time yarnbombers from first time yarnbombers. 1. Knit everything slightly smaller than you think it should be. Wraps need to be firm to stay in place throughout whatever weather is thrown at them. 2. Don't darn in or cut off the ends of your yarn at colour changes. The ends can come in handy to sew on large pieces using the colours you've already got which makes the join neater. 3. It's totally more fun to 'bomb' under the cover of darkness. Even if it means you have to be up before the sun. You'll also be able to tell if you'd make a good criminal* and how stealth you actually are. *Terrible. 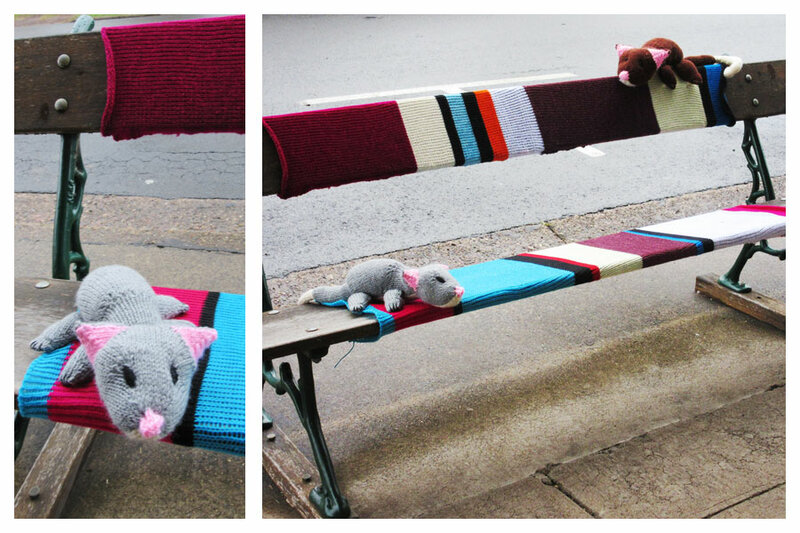 I was late and then forgot to bring the actual knitted piece to wrap around the street post. And also forgot scissors. So, yeah... no, not stealth nor would I make a good criminal. It’s been a few weeks now since the launch of ‘Make Your Mark’ and thankfully everything seems to be working. It is however, not a super quick process, more like the pace of a snail at times. But like any custom or handmade project I guess that comes with the territory. There are basically three major production steps. First is pre-production. This is where we take your supplied artwork and make sure it will print well. At this point we look for things like colour and image clarity as well as check the technical size is going to work on the outcome. It’s important to make sure that the file looks good so the print will look good. Next is printing. We send our files off to an Australian based digital printer and try and wait patiently for their return. On average it takes about a week and a half to get the fabric back. Once we have received our custom printed fabric it’s into stage three of manufacture. This is where we make up the product or kit as ordered, ready for delivery. We try really hard to complete each step as quickly as possible, especially in those stages where we have complete control. However, there are times when we have no control over timing at all. Which, yes, freaks us out. But during which we try and remain calm. From the initial order to final delivery can take up to four weeks (sometimes more, sometimes less). While it might seem like a long time between placing your order and receiving your final product in the mail, you can see there are plenty of things that need to happen along the way. We hope that the timeframes don’t put you off getting something custom made; they do say that ‘good things come to those who wait’. It’s been pretty quite here on the old blog for a while. But happily at least, it’s because there was a bit of work going on behind the scenes rather than just total procrastination. This week, I launched my first print based project 'Make Your Mark'. And it’s a pretty fun one. The project has been in the works for years. Most of which was just percolating at the back of my brain somewhere. The initial idea came when I was studying textiles at uni so I was probably more aware of surface and printed pattern than I’d ever been. Then I’d visit my mates who were in their first few years of parenting and their houses were filled with beautiful vibrant painterly artwork created by their small offspring. And in my brain I’d think “look at that expressive paint work, there’s no way you could capture or recreate that sense of freedom and exuberance as an adult” and then I’d say out loud “this would make an amazing fashion/homewares print”. And so that is where it started. Then with all the positive reactions from my kids inspired ‘Make My Beanie’ contest winner last year I thought it might be time to create this printed version. It’s much quicker to print rather than knit, you see. So here goes, I’ll keep you posted. So while it’s been quiet here on the website it’s not because I’ve been busy behind the scenes getting my new projects underway… instead I’ve been on holidays. Or a textile adventure, as I like to call it. I’ve just got home from Japan, which was amazingly full of lovely crafts and craftspeople. Some of which I’ll try and cover over the next few blogs. One of my favourite stops was the village of Hida-Takayama, which is the birthplace of the Japanese embroidery technique of sashiko. Sashiko is one of those needlework styles that look really easy. And it kind of is, ultimately its just running stitch. There are things to consider though, like perfectly straight lines, sharp corners and the basic requirement of consistent stitch length. All of which can mess with you, if you let it. I was able to get a quick lesson from a sashiko master who did in fact make it look ridiculously easy. She was also the fastest hand embroiderer I’ve ever seen! 1. Never use knots to start or finish the thread lengths. Instead they are left with approx. a 3-4cm end and depending on the finishing of the product the ends are hidden in seams or by backing, allowing the inside of the embroidery to be just as interesting and lovely as the outside. 2. Instead of doing one stitch and pulling it through the fabric, anchor lots of stitches on a long needle. So much so that the fabric gathers together before you pull the thread through. This will help keep all your stitches nice and straight. 3. It’s pronounced sa-shi-ko, not sash-i-ko. Recently I’ve been running my very first competition, #MakeMyBeanie. To enter you had to colour in the supplied beanie template with the winner receiving his or her own beanie made. I had some great entries but from the start I was hoping to get one that would push the creative boundaries a bit, something that may be a bit of a challenge. And I always look at a kid’s artwork and see amazing textile potential, so for me choosing the winner was a pretty easy choice. Normally I create adult size beanies but because of the design it seemed necessary to scale down a little. So firstly, a bit of math and some basic planning was required. Because in knitting we start at the bottom and work upwards the first real challenge was how to create that rib. I thought the easiest way to achieve a similar black and white mix was to simply knit one black yarn and one white yarn together to create a marl effect. Interesting as it knitted it created obvious horizontal lines which initially I wasn't so fond of but grew on me (probably because there was no easy fix). 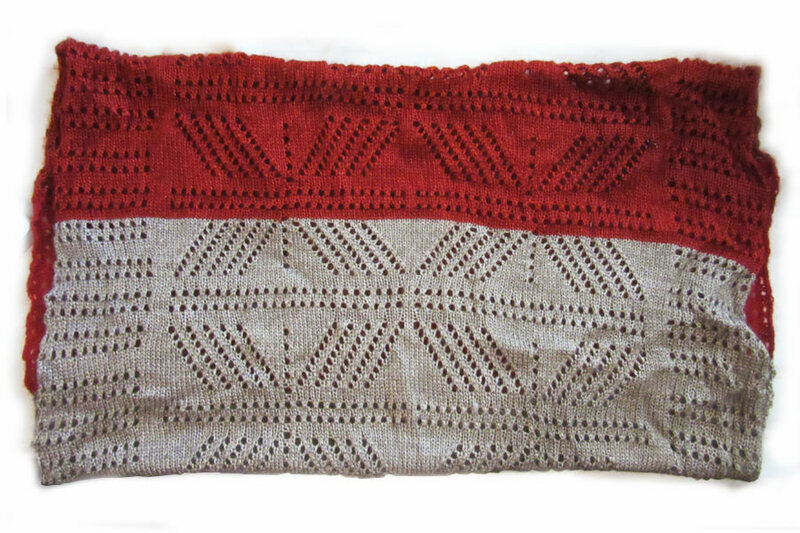 Once the full piece of knitting was done it was time to embroider the coloured design into the fabric. Using both swiss darning and backstitch techniques I did the design by eye rather than drawing it out first. While it means it's slightly disproportionate in places I hoped it would help recreate the free loose line work of the original. From there it was just a matter of finishing touches like the pom pom and tidying up all the loose ends. I have to confess I LOVED this project (enough that I'll probably run another one next year), and I am SUPER happy with the result. I hope it's new owner will be as well. So this week I joined up to the Etsy Creative Courage Challenge. Which fingers crossed means that by the end of the challenge, in a month or so, I'll have my very own Etsy store. With products in it and everything. Initially I wasn't sure I'd use Etsy as a store front. I'd done a lot of reading in the lead up to launching my brand and I had read a few things that slightly put me off being a Etsy vendor. The research I found indicated that if you had the ability/resources to set up as your own online shopfront, then do it. It allows for a stronger brand identity. The other thing I read that scared me a bit was people saying that for whatever reason Etsy had shut down their store. In that moment they realised that even though they thought they 'owned' their store, they really didn't. Don't get me wrong, I'm sure there were circumstances that Etsy did what they thought was right in regards to a seller breaching contractual rights. But at the end of the day, Etsy has all the power. Recently though, I had been thinking about joining up. People were asking if they could find me there and with winter coming to an end here in Australia it makes sense to try and tap into a wider marketplace. Coincidently I saw that Etsy had just launched their Creative Courage Challenge so I signed up. I figure what's the worst thing that can happen, right? And to be honest they had me at ALTA PAPERCRAFT's awesome promo animation. AND THEN this morning Pip Lincolne told me she thought I was a genius (see visual proof below)! So that's that, now I'm completely sold to this whole Etsy thing, add me to the list with the other 1.5 million sellers and let's see how we go. With musk ox yarn bought what’s next on the qiviut trail in Alaska? That would be this little gem in Anchorage. The Oomingmak Musk Ox Producers’s Co-operative is a Native owned co-op with members made up of women living in various remote villages around Alaska. The members knit garments from musk ox yarn and sell their items through the co-op, with the income going back to the craftspeople. Established in 1969 it has grown from 25 members to over 200. Interestingly, from what I have read, knitting isn’t a traditional craft of the First Nation people but by using their local yarn and incorporating traditional patterns in their designs they are creating a very unique new craft tradition. While I was at the Oomingmak Co-op as well as picking up an Alaskan Handknit, I bought a copy of Arctic Lace by Donna Druchunas. It is a fantastic book, which includes lots of info on qivuit, the co-op, and has great lace knit patterns. So what have I made with my yarn? So far I have knitted a traditional Smoke Ring or Nachaq Hood. Which is a short tubular scarf that can be worn a couple of different ways, either around the neck and/or over the head. It’s very lightweight, especially with the lace work, but also very warm. I wish you could reach into the screen so you could feel the yarn, because it really is amazing, instead you might have to head to ‘the last frontier’ yourself for the full adventure. This Nachaq Hood pattern can be found as a hand knit in Arctic Lace by Donna Druchunas. 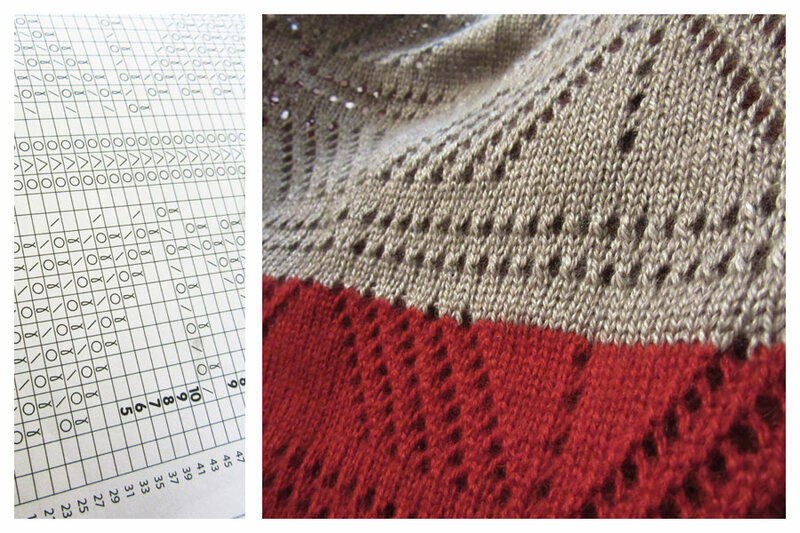 I used the hand knit pattern in the book but converted it to be machine knitted. I thought I’d start with Alaska because… well, it’s pretty special. I’d done my textile research before we left so I knew there was one very very special thing in Alaska I wanted to find and that was musk ox yarn or qiviut (kiv-ee-yute). Qiviut is considered the softest wool in the world, softer than cashmere, and is extremely warm. It’s also really rare and is one of the most expensive yarns in the world dubbed ‘the qolden fleece of the Arctic’. The musk oxen naturally shed their underdown fibre (qiviut) each spring, up to 2.5kgs per year, which is collected to produce yarn. The Itchy Little Musk Ox by Tricia Brown. Illustrated by Debra Dubac. While there are still wild animals, there are also a few musk ox farms around the state which you can visit at certain times of the year. Instead we visited the Alaskan Wildlife Conservation Centre and while everyone else headed off to see the bears I excitedly went to visit the musk ox herd. In my head I thought they’d be a similar size to a bison, but they were so much smaller. I loved them. And yes. I bought qiviut yarn. Of course I did. And yes, it cost a lot. Stay tuned for more textile holiday adventures including more from Alaska.